Once you have made both gauntlets, it is time to graft them together. This will give them more or less a seamless appearance. If you are making the Poppy Cowl, much of this will seem to be review. First, you need to unzip the provisional cast on, or, if you have used the waste yarn method, simply move the stitches to a needle. I prefer to use circulars for the greater flexibility they afford. Orient the needles so that they are parallel (East/West) if you are located on the Southern mark of the compass. Like so: You will want to cut the live yarn and thread it on a tapestry needle. Leave a good long tail. You won’t want to splice together or weave in ends while grafting. So, with your needles parallel and wrong sides together (don’t forget the cowl twist) . . . turn 1 end over once, then twice so the ribs line up. You can see that you have a front needle (closest to you) and a back needle (farthest away). NEXT: you will do 1 of four things depending on what the next two stitches on the front needle are: Each time you will do something to 2 stitches on each needle, and each stitch will have the yarn go through it twice. For front needle, put tapestry needle in the stitch as if to knit and then drop that stitch off needle, then put the needle in the next stitch as if to purl and leave it ON the needle. On back needle, put needle in first stitch as if to purl and drop stitch off needle, then put needle in the next stitch as if you knitting and leave it on the needle. Repeat these steps until you run out of stitches. Stop often to see if it looks right and to adjust your tension. Week 7: Beginning the SKIRT! First, forgive the late post. I have no good excuse except I didn’t realize it was Monday. Sounds impossible, but there you are. So sorry! Won’t say another word about it! Finally! We are ready to make the skirt! 1. A Tale of Two Ellas: As you know by now, the original Ella had you begin the skirt at the bottom and it is the first thing you do. I have saved it for week 7 in order to make the coat more accessible and easier to fit. The Ella Rediscovered pattern has you begin the skirt at the bodice and work down to the hem. That is what I want you to do. 2. What You Need to Know: All you need to know at this point is your original bodice cast on number. For those with the original pattern, here are the numbers:144 (164, 180, 200, 216, 236). If you altered your CO for fit, go with that number. If you followed my advice way back in week 1, you have markers just waiting for you in the marker locations you will need for the skirt. If you did not follow my advice, you will re-place markers where you placed them when you cast on for the bodice. Here is the text from Week 1 that tells you where to place the markers: Row 1 (WS): Purl across, placing 6 markers as follows: p18 (20, 22, 25, 27, 29), pm for center left front; p18 (21, 23, 25, 27, 30), pm for left side seam; p18 (21, 23, 25, 27, 30), pm for center left back; p36 (40, 44, 50, 54, 58), pm for center right back; p18 (21, 23, 25, 27, 30), pm for right side seam p18 (21, 23, 25, 27, 30), pm for center right front; p18 (20, 22, 25, 27, 29) to end. 3. My Innovations & Tweaks: In order to work the skirt by picking up the bodice stitches and working down, you will return to the bottom of the bodice and pick up and knit according to your size on the RS of the bodice fabric. If you have been working on the bodice and feel that it is a bit short, I recommend that you pick up the whole stitch. This will make the transition from bodice to skirt almost invisible. If you need greater length in the bodice, work down for a bit before you start the increases for the skirt. If you would like the bodice cast on to show, you will pick up in the back half of that first cast on stitch. And let’s imagine that you want a sort of “belt” look. You will pick up in the back half of the cast on stitch, work down (no increasing) for about an inch and a half or desired length and then cast off again–being careful to transfer your markers to stitches–and then pick up again in the back half of the stitch. It’s a great detail! 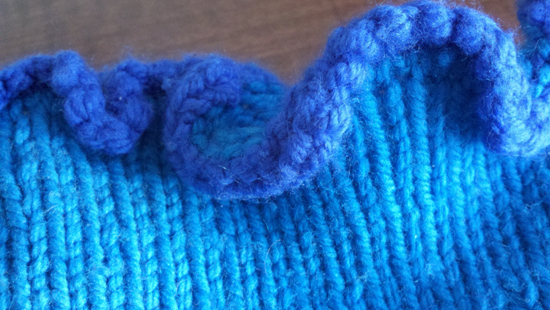 If you want to fake this detail, simply knit on the purl side. Doesn’t look the same but has a similar effect. I want you primarily to be concerned with making sure the bodice length is correct for your body and that the coat is fitting. If you want greater width in the skirt, start increasing sooner and increase more often. If you want less width, begin increases where they occur but increase less often–that is put more rows between one increase and the next for a straighter skirt. *Knit to 1 stitch before first marker, M1L, k1, sm, k1, M1R; repeat from * 5 more times, knit to end–12 stitches increased during each increase round. Continue increasing every 14 (or desired #) rows until skirt is the length you desire. You have three weeks to work the entire skirt, so no rushing! People working stripes, enjoy this process. People working striped borders, please keep this in mind as you work down. How much of a border do you want? If you are matching the border on sleeves, you will have to start the stripe pattern at the right point to get the right length. Try on your coat every once in a while to see if you like the length. Remember, Ella can be many coats. She can be hipbone length, mid-thigh length, just above the knee, just at the knee, duster length, to the floor, she could have a train. . . The choice is yours. Some of you may already have launched forward and grafted the cowl ends. I have seen inklings of this in your postings on Rav and Facebook. If you have not, however, done the grafting yet, or are unhappy with the grafting that you have already done, read on, because grafting the cowl is this week’s assignment . . . the only cowl assignment. It sounds easier than it is, I must say. Maybe you are all better grafters than I am, but I find grafting a rib tricky and it requires my full attention. I must make sure I have slept, eaten, have a glass of water nearby, and lot of light. Do not try to do this in the car or at a sports game while you are sitting on the bleachers. . . I wouldn’t even attempt this in an aiport. A quiet, well-lit place is what you (really, what I) need. There you go. Good luck. If you get frustrated, you can always cover up the graft with the poppies. But you will want to graft the gauntlets perfectly, so see this as practice. I have been at work getting the Perfectly Simple Gauntlets read for you. These little, easy-to-make gauntlets will go perfectly with your Poppy Cowl. . . if you plan to make your gauntlets in Nora No. 7, 1 skein is all you will need. Because the gauntlets are quite small and fast to knit, you will be finished in no time. . . but your assignment is to finish at least one glove but do not graft it together. I will be talking about grafting on Friday for the Oriental Poppy Cowl knit-a-long, so you will have the instructions you will need. . . but I’ve got plans and ideas and I want you to consider all your options before you commit. 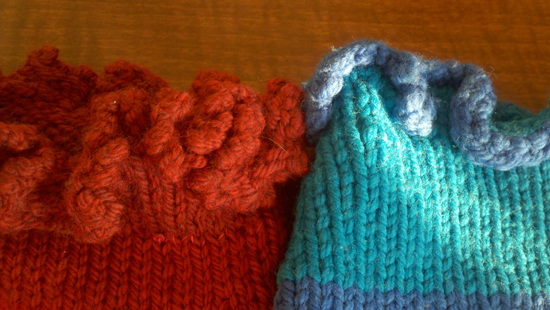 We will rendezvous next Wednesday for a session of ideas about finishing and decorating these little gloves . . . that can take them from simple to quite extraordinary. Or you can pull them almost to the elbow for extra warmth and drama. I have plans to make multiple sets in different colors. I’m going to play with gauge, too. Made in Red Barn Yarn Worsted, they are structured and very warm. Because Shepherd’s Wool is a bit lighter weight with more drape, they can transition into Spring and they can be the first you get out of the cedar chest as we move from Summer to Fall. You might wonder why I didn’t just cast on in knit, join, and work some number of rows, then some number in purl, etc. I thought about it. . . A similar look can be achieved, BUT, because every woman is different, this would require multiple sizes and none would fit you perfectly. 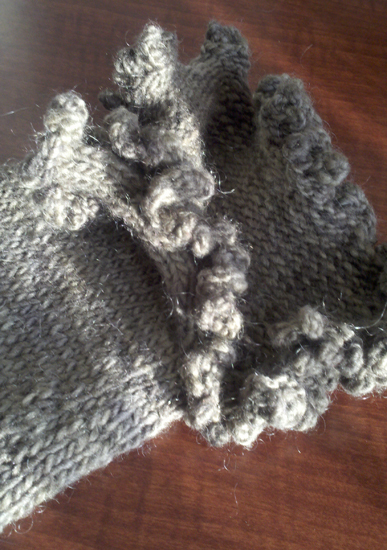 With my simple gauntlets, you determine the size of your gloves and the way knitting stretches means that the gloves stretch where you need them to stretch (across the palm and the widest part of your forearm) and get shrinky where you need it (the wrist) without short rows, increases, or decreases. Next Wednesday, as we near the end of this little project, I’ll give you some ideas about how to personalize your own gauntlets with different finishing treatments, with floral or other decorations. Gauntlet patterns are already up on Ravelry to download. If you’d like a custom kit picked and packaged by me personally, complete with Nora No. 7 or a skein of Shepherd’s Wool in any one or several of their luscious colors, and a metal Noni label, let me know. This week is an easy week. Your task is to work the collar and neck ruffle. If the live chat audience is a good cross section of the entire Ella audience, then some of you are holding off making a decision about what sort of ruffle you want to use for the entire coat. This is fine . . . I have to confess that I save most of my ruffles for last. . . The original Ella neck/collar was worked in stockinette stitch and had a conventional ruffle. As you will notice in the picture below, the collar is soft and unstructured and no amount of blocking would persuade it otherwise. As it is, it falls open and reads like a soft v-neck collar. You might notice that the collar goes all the way to the placket. This is because I worked the collar after I worked both front plackets as written in the pattern. . .
My new Ella collars are worked in a 1×1 rib and end with the super picot ruffle introduced in last week’s post. But they are worked before the plackets on the front of the coat. You can see in the picture below (when compared to that above) that the plackets on the front are picked up on the side of the neck ruffle rather than the neck ruffle extending all the way to the end of the placket. The feeling is quite different for several reasons: The 1 x 1 rib gives the collar greater structure. It also makes it stretcher and looks the same on either the “inside” or the “outside.” AND the extension of the front plackets up the edges of the neck ruffle (and another secret tweak I will divulge when we get to the front plackets & ruffles) also adds structure and gives the neckline more of a V-shape look with the weight of the ruffle pulling the collar open. I like both but they are different. If you are going to follow the pattern with the front plackets done before the neckline, you will not have much to do this week, I’m afraid. . . except make your gauntlets (look for information about that pattern link in Wednesday’s post) and make Bling or Cactus Flowers to decorate your coat (look for these patterns in your local yarn store. You can see what they look like on Ravelry). The Ella out of the Red Barn Yarn Hand-dyed in Mushroom is a more structured coat all around so the collar itself is more structured and likely to stand up. As you see it behaving here is almost how the collar behaves when you are wearing it. Here you can see the collar is not as tall as the Mushroom Ella and has more drape. As do the others, the collar stays open when I wear the coat. For this week, the only official assignment is to work the neck and any ruffle at its edge. The unofficial assignment is to catch up if that has been at all an issue–I know we have some late-comers joining us, so this gives some a chance to get closer to where we all are knitting (I, personally, am starting 2 new Ella coats–one for me and one for Melissa!. . . pics of them as soon as there is anything fun to show!). So, finish whatever might be remaining on the sleeves, finish those cuffs and cuff ruffles. . .
For the collar treatment pictured in the pattern, you will have to wait. For a stockinette or 1 x 1 rib collar worked as my new Ellas are, here is how you will pick up stitches (on the right side): 20 (21, 22, 23, 23, 23) sts along right front neck edge, 26 (26, 30, 32, 32, 32) sts across back neck, 20 (21, 22, 23, 23, 23) sts along left front neck edge. 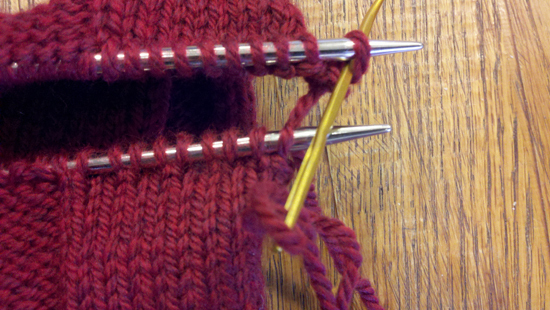 Tweak slightly if necessary so that your total number of stitches is divisible by 2 + 1 extra stitch. 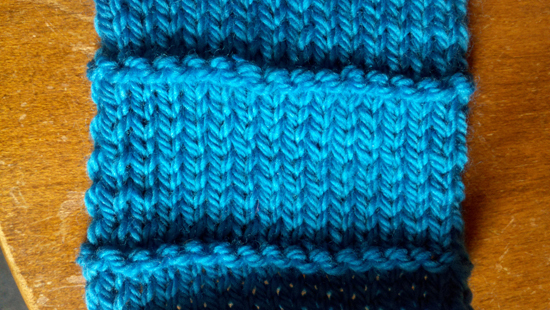 Begin your 1 x 1 rib with a knit stitch, *p1, k1; repeat from * across, ending with k1 for a lovely symmetry. Next row (RS): Starting with k1, work a 1 x 1 rib across and end with k1. Work in established stitch pattern until the collar reaches the desired length. I check this two ways: 1. Were a strong breeze to come up and coax me to pull my collar up around my neck, does it do the job? And, 2. When the collar lies down, as it will most of the time, do I like it? When the answer to both of these questions is yes, I’m finished. Time to ruffle. You may, of course, choose to use the more relaxed ruffle style in the original pattern. It takes less time, yarn, and is more understated. If you are smitten with my favorite ruffle, here it is again just I introduced it in last week’s post. I employed this same ruffle at the end of the collar as well as the sleeve cuffs, plackets, and skirt hem. RS: Kfb across the row. RS: *Kfb, k1; repeat from * across row. WS: Execute a picot bind off as follows: *Using a cable cast on, CO 2 stitches, BO 3, placing the stitch that remains on the right needle back onto the left needle; repeat from * until all stitches are bound off. Truth be told, not much to check on this week . . . except the length of the collar, as I mentioned above. You may want to try on your Ella bodice as you are working to see how long (tall) you want the collar to be. I made my Ella collars between 3 and 4 inches long. Please your own eyes and sensibilities! As you may know, we are working on the Poppy Cowl mini knit-a-long. This week I will discuss grafting a rib pattern as well as introduce my matching gauntlets pattern. 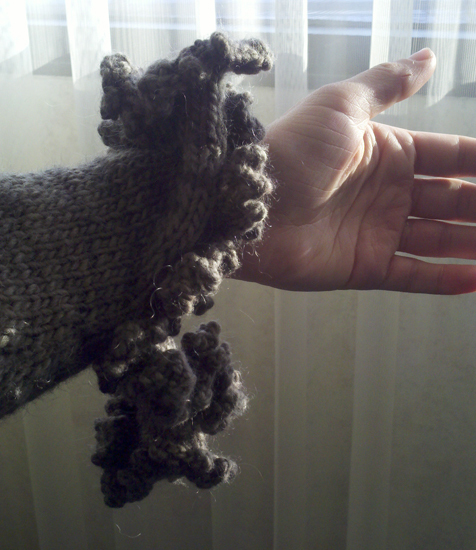 I will have the gauntlets uploaded onto Ravelry on Wednesday. Shops, I’ve got paper patterns you can order! Just write to orders@nonipatterns.com. If you’d like, you may want to start making some Bling or other flat profile flowers for decoration. . .You can see a couple of little flowers I have pinned to my Ocean Stripes ella (above). . . Usually I have more but I probably took some off to wear in my hair. I used the flower clips I distribute for this purpose. Easy to sew flowers to the clips and then clip to anything. See more about these in previous postings on flowers. Come to the live chat Wednesday, February 22 between 9 and 10 for a special announcement! Whatever you decide to work on, please post your pictures for everyone to see! This week, we are finishing the sleeves! I urge you to read the entire post before launching ahead. I will give you the specific differences between the two patterns first and divulge my ruffle secret on a platter, then go over the techniques you will need for this week’s assignment, and finally offer yet one more cuff innovation you might want to consider. 1. A Tale of Two Ellas: Both the original Ella Coat and the Rediscovered Ella Coat have you working the sleeve ruffles the same way. You put your provisional stitches back on the needle, work down until desired length, and then begin the ruffle. This is a lovely ruffle. . . but if you want something almost ineffably more fabulous, try my personal tweak to the pattern and you’ll get a ruffle that looks like THIS! Here you see the difference. . . decided which ruffle you’d like to employ for the ruffley bits for your own coat. 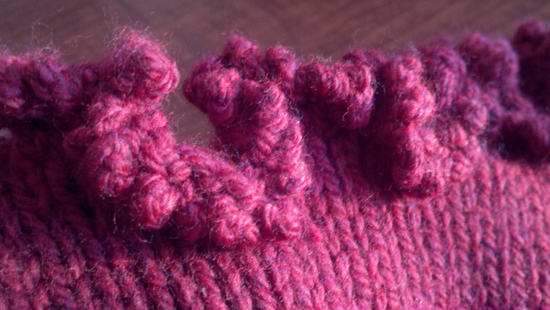 I recommend that you swatch the original ruffle from the pattern across about 16 stitches. Then do the same for this new ruffle. See which you prefer. If you have other ideas for a treatment that will work for neckline, front plackets, sleeve cuffs and bottom edging, please share. I did hear grumblings that a shop in Michigan was swatching I-cord bind off edgings and I am keen to see how that is turning out. I will not sugar coat this: it is sometimes tedious and takes some bit of time. I refused to count my stitches because then I might get, well, distracted by the number. But it is simple to do and you can even fudge it sometimes and CO 2 and BO 4 or something like that about half the time. The delicacy of stitches is delicious. If you are daunted by what I’m saying, you should do that swatch exercise I mention before you commit. But I’m telling you, you’ll love the results and no regular ruffle can rival it. . . this may be as good as throwing down the gauntlet for some who will scour the internet for a rival ruffle . . . If I’m wrong, I’m happy to admit it, but show me optical proof! Cable Cast On, the text with pictures (this tutorial explains more than one type of cast on method but pays particular attention to the cable cast on method. I use the cable cast on without the twist: Check it out here. Cable Cast On, the video. KnittingHelp.com has two videos, one showing how to perform this cast on if you are a Continental knitter. and one showing the English method. Picot Bind Off, the video. This video is straightforward for those who want to see the picot bind off worked in addition to reading how it’s done. See it here. 3. My Innovations & Tweaks . . .
NEW: French Cuffs for Ella! This is my most recent Ella innovation. . . Take a look at how fabulous they are! In week 4 I implored you not to move forward with the cuff ruffles themselves but to make the sleeve the desired length by leaving it alone, shortening, or lengthening. At this point, then, you should have sleeves that are just right. I asked you to leave at least 4″ (10cm) un-seamed at the cuff end. This way you could try on the bodice until sleeves were perfect, but then put the whole project carefully in your knitting bag or basket waiting for today. . .
Well, as I was working on my own latest Ella, I had the idea for French cuffs. So, if you’d like to follow my example, here’s what you do. Don’t seam the sleeve all the way to end! Leave between 2 and 3 inches unconnected. I won’t dictate the length as your taste trumps mine and you might have longer arms than I do. Please your eye, or the eyes of those nearest and dearest to you. You already have the live cuff stitches waiting for you and you have closed the seam to the desired point. Now, with the right side facing you, you are going to pick up and knit the stitches from seam to cuff on the left side of the sleeve as it lies on the table in front of you (cuff farthest away from you and the body of the sleeve nearest you) Pick up stitches on the left side of this opening, starting closest to the moment where the two parts of the sleeve come together. Pick up and knit 3 stitches for every 4 rows until you get to your live stitches, work across those live stitches, then pick up and knit 3 stitches for every 4 rows on the right side of the remaining part of the opening. Purl back across all stitches. Then make your ruffle as written, as you please, or as I did . . . (refer to My Favorite Ruffle instructions above). The ruffles do not add much length, so I recommend that the sleeves are the right length before you start the ruffle itself. Don’t forget that Week 2 of our Cowl diversion/mini-knit-a-long is this Friday! I have added pictured to last Friday’s post of red poppy cowl colorway, so take a look and join us! Patterns can be purchased through your favorite participating yarn shop–the newest participant is a shop in Howell, Michigan named Stitch in Time. They are prepared with red poppy cowl kits! with the pink and purple ones on the way to them this week (as soon as I get home to ship them out!). I have been working on a new diversion for you, a simple pair of gauntlets and matching (poppy) cowl to go with your Ella coat or just about any other outfit. Quick to knit, and fun to wear slouchy or more like opera gloves, 1 skein of Shepherd’s Wool will make a pair of gauntlets and 1 skein will make the cowl. If you are making your cowl and gauntlets out of Red Barn Yarn Worsted, 2 skeins will make the cowl and 1 skein will make matching gauntlets. Before I go any further, I must apologize for not posting sooner about this knit-a-long. Please forgive me. I am at the Pittsburgh Knit & Crochet Festival. . . I have a booth here and my dear friend Mary Elliott is helping me. 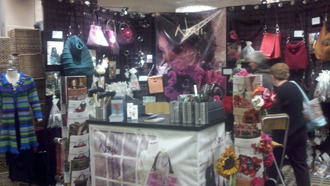 We were up until 2 am working on the booth to make it a sparkling Noni Boutique! Pictures to be posted to FB shortly. But to the Knit-a-long: We will begin with the cowl. The cowl is a simple project. If you can knit and purl, you will be golden. Cast on as written in the Escher’s Oriental Poppy Cowl pattern. You will want to choose a true worsted weight yarn. If you choose a light worsted, you may use more yardage than the recommended yarn–please prepare and make sure you have enough yarn. The cowl itself is simple to make. Work it flat to the 42″ or desired length. I will talk about grafting it together next Friday. . . 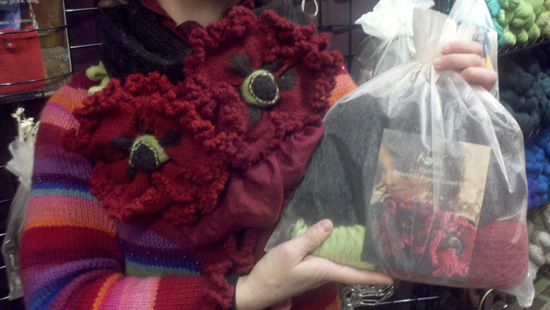 I just got my beautiful REDS colorway poppy cowl back from the fashion show here at the Festival. I have to thank Steven Be for saying lovely lovely things about my work, the Ella coat, The Poppy Cowl, and my brand new New York bag (so new it’s not even on my website yet, but stay tuned. . . talk about an AMAZING ensemble)! As many of you already know, the pattern for the Poppy Cowl and also for the Kit are up on Ravelry to download. If you’d like a custom kit picked and packaged by me personally, complete with heavy cardstock paper patterns, Shepherd’s Wool in the luscious poppy colors of your dream, complete with a metal Noni label and the Noni-only Nora No. 7 for the cowl itself, let me know. We’ll check back in next Friday for the next step: grafting the cowl together so it looks flawless. Come see me in Pittsburgh! Remember to check back for pictures here in this post and on Facebook. . .